Most people wait for the sight of their ripening tomatoes on the vine to signal the arrival of summer. For me it’s more like waiting for a collage of images to welcome summer: dangling grapes, elegant japanese eggplant coming to full color and, yes…my gorgeous grandchildren, the heirloom tomatoes with their jeweled heritage on grand display. 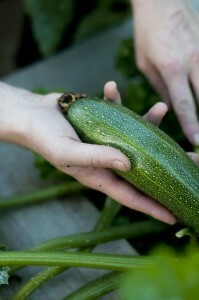 But summer isn’t quite here unless I see my workhorse of the garden, zucchini, in its full splendor of production. And produce it does!!! Two plants should be enough to feed a family of four (including oodles of zucchini bread!). Let’s get started…summer won’t wait! Cucurbita pepo. Squash is a member of the cucurbita family, which includes melons, pumpkins, cucumbers, and gourds. Zucchini, as it is most commonly know in America, is an Italian word. These veggies are known as “courgettes” in parts of Europe, and “vegetable marrow” in Britain. Other names include “long marrow” and “garden marrow”. Zucchini is a summer squash, meaning the fruits have soft, edible skin. Summer squash are fast growers that can be harvested in 35 to 55 days. Optimal conditions for planting zucchini include the right location, proper soil preparation, and favorable temperatures. Being tropical in origin, summer squash is a frost-sensitive annual plant; temperatures over 70 degrees Fahrenheit are favorable for growth and development. Sunlight is essential, so locate plants in an area that receives 6 to 10 hours daily. Fertilizer: When planted in compost-rich soil where nutrients are released slowly, additional fertilizers may not be required. An organic liquid fertilizer such as liquid seaweed may be applied at 2- to 3-week intervals where soil isn’t as fertile. Avoid high-nitrogen fertilizers; they will only encourage more leaves and stems. Watering: Adequate soil moisture is very important, especially during flowering and fruit development. Soil should remain moist, drying slightly between waterings, but it should never be allowed to dry completely, nor should it remain too soggy. Avoid overhead watering-water the soil, not the leaves. Soil-borne diseases can cause problems to plants if water splashes up from the soil to the leaves. Water deeply (2 to 3 feet) once a week during the cooler weather, and increase watering to 2 or 3 times a week in the summer. Mulch heavily with organic material to help maintain and moderate soil moisture. Wilting leaves during the hottest part of a summer day are not always an indicator that the plant needs more water. When in doubt, check the soil. Squash are insect pollinated so they can also be hand-pollinated. 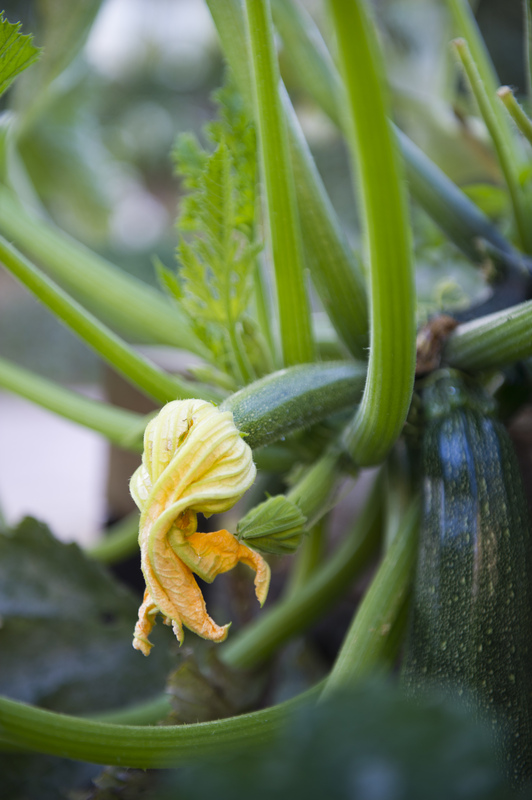 For best fruit production pollinate the zucchini flowers yourself early in the morning before the flowers close. The easiest way I’ve found is to cut a male flower from the plant, carefully remove the petals leaving the stamen intact, and then dab the stamen directly into the center of a female flower (stigma). Close the female flower again so bees can’t get in. Tag the blossom (this is for seed id if you’re saving seed). Of course if you have plenty of bees or other beneficial insects around the garden, they will take care of pollination for you! Squash plants produce male and female flowers on the same plant. Don’t be discouraged at first if all you find are male flowers. Many times squash plants produce more males early in the season. It won’t take long before you begin to see female flowers. The female squash flower has a miniature fruit at its base and is borne on a short stem. The male flower can be identified by its long thin stem and a stamen in the flower’s center that provides pollen necessary for fruit development. If you look closely inside male and female flowers set side by side, you can easily see which is male and which is female. Contrary to a common misconception, cross-pollination in these family members (i.e., cucumbers will cross with pumpkins) only occurs between varieties of the same species. Therefore, when more than one variety of the same species (in this case, C. pepo) are grown together in a garden they will easily cross, resulting in daughter plants with different fruit from either of the parents. So be aware of this if you plan to save seeds when planting your zucchini with varieties such as pumpkin, crookneck, or acorn squash! Common pests associated with summer squash are aphids, spider mites, squash vine borers, and whiteflies. Planting nasturtium with zucchini reduces aphid problems, however, nasturtium seeds are slow to germinate and should be planted before the squash. Insecticidal soap may be used to control aphids, spider mites, and whiteflies, but be sure to dilute the spray and refrain from spraying in the heat of the day because squash leaves may burn easily. It is wise to test a few leaves first before spraying the entire plant. And don’t forget the undersides of leaves, where spider mites and whiteflies are usually found. To control squash vine borers, spray the base of stems once a week with Bacillus thuringiensis var. kurstaki. To harvest the edible flowers: Squash blossoms are edible flowers, raw or cooked. Both summer and winter squash blossoms can be battered and fried in a little oil for a wonderful taste sensation. Harvest only the male blossoms unless the goal is to reduce production. Always leave a few male blossoms on the vine for pollination purposes. There are always many more male flowers than female. Harvest only the male squash blossoms unless you are trying to reduce production. The female blossom can be harvested with a tiny squash growing at the end and used in recipes along with full blossoms. Use the blossom of any variety of summer or winter squash in your favorite squash blossom recipe. Use pruning shears or a sharp knife to cut squash blossoms morning to midday when the petals are open, leaving one inch of stem. Gently rinse in a pan of cool water and store in ice water in the refrigerator until ready to use. The flowers can be stored for a few hours or up to 1 or 2 days. If you’ve never eaten squash blossoms, you are in for a treat! Can you eat zucchini greens? Well, haven’t ever eaten them myself. As a matter of fact, leaves on the mature plant are pretty pricklely! They also can cause slight skin irritation if you’re sensitive (I had to make my students put their gloves on after some of them went to the nurse w/ rashes) so I can’t imagine eating the mature leaves. The young leaves, however, are pretty soft. Couldn’t find any reliable source that said they were edible…so can’t be sure.